Co-Is: Camille Lique (IFREMER), Claude Talandier (CNRS), Mickael Accensi (IFREMER), Marion Huchet (CNRS). In the quiet Arctic Ocean, which is isolated from the atmosphere by the sea ice cover, vertical mixing is generally very low. 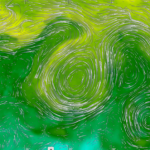 It can be however intensified in very localized sites, and an accurate representation in models of the mechanisms explaining these intensifications is crucial to properly simulate the Arctic ocean and sea ice state. 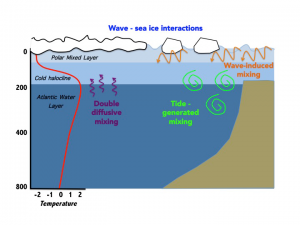 The goal of ArcticMix is to examine the importance of different contributions to vertical mixing that are currently not taken into account in most numerical models used for research or operational purposes, namely the double diffusive mixing, the tidal-induced mixing, and the effect of waves for both the surface ocean and the sea ice. These processes are summarized on Figure 1. In this project, we have developed and optimized a high resolution configuration (3-4 km) of the Arctic and North Atlantic (named CREG12), which is a regional extraction of the global NEMO-LIM3 ORCA12 configuration. While we found that the parameterizations of double diffusive mixing and the space and time varying tidal-induced mixing currently available in NEMO works reasonably in the Arctic Ocean and most likely improve the physics of the model, our results also suggest that these two sources of mixing have only moderate effects on the Arctic Ocean stratification and sea ice conditions. On the other hand, the ad hoc parameterization of mixing induced by wave breaking has a huge effect on the surface ocean and sea ice conditions, and would require additional work to constrain better the parameterization. We have then investigated the interactions between waves and sea ice. 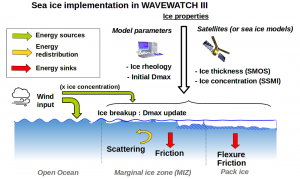 First, a sea ice module has been added in the wave model WAVEWATCH III, the physics of which is detailed on Figure 2. Second, we have developed and implemented a coupling between the wave model WAVEWATCH III and LIM3, making use of the coupler OASIS-MCT. The results provide insights on which processes behind the wave-sea ice interaction are the most effective and needs to be taken into account to explain the sea ice and wave evolutions in the Marginal Ice Zone. 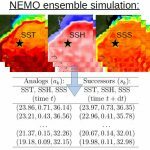 All the model developments as well as the evaluation of the impact of different parameterizations resulting from this project will be directly applicable to the global NEMO ORCA12 configuration, which is used by CMEMS.